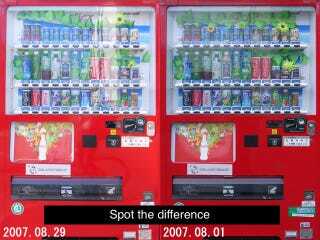 As you can see from the top images, August is a quiet month in the world of vending interiors. July, however, on the left, was mad crazy, with all the products moving one place to the right. In case you don't know what his arrows mean, Mr Terada also writes down the changes, rather like a chess game &mdash C3 to C4, C4 to C5, etc etc.